Charlotte County, named for Charlotte Harbor, is a place of unrivaled natural beauty, located on the beautiful west coast of Florida, about 20 minutes north of Fort Myers and 40 minutes south of Sarasota. Established in 1921 from a portion of De Soto County, it is bordered by the Gulf of Mexico, Charlotte Harbor, and Sarasota, De Soto, Glades and Lee Counties. Charlotte comes from “Carlos” (English) or “Calos” (Calusa Indian). In 1565 the Spanish named “Carlos Bay.” They were followed by the English in 1775, who named the area Charlotte Harbor in tribute to Queen Charlotte Sophia, wife of King George III. Charlotte County is located on the west coast of Florida. Charlotte County includes the communities of Port Charlotte, Punta Gorda, Venice, and North Port, and includes the scenic Boca Granda and Cayo Costa islands at the mouth of Charlotte Harbor. The county includes some 120 miles of natural shoreline bordering Charlotte Harbor, the Peace River, Myakka River, and its many tributaries and creeks. 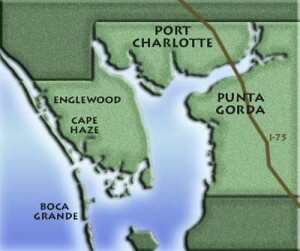 Punta Gorda, the only incorporated area in Charlotte County, was incorporated in December 1887. It was originally called “Trabue” in 1885 after the developer Isaac Trabue. Port Charlotte, created in the 1950s, remains an unincorporated area. Englewood, also unincorporated, lies half in Charlotte County and half in Sarasota County. It was founded in 1894 by Herbert Nichols of Englewood, Illinois, who established lemon groves here. A boating and fishing lifestyle is as natural in Charlotte County as breathing. Golfers can pick from nearly two dozen golf courses, and parks, cultural activities and other recreational activities offer something for everyone. This area is justifiably known as “Pure Florida” for its pristine wilderness, waterways and wetlands. From canoeing or kayaking in the peaceful dawn quiet on the Peace River to biking, hiking, bird-watching and manatee- and gator-spotting, the outdoor lifestyle reigns supreme. Deep-sea fishing is just a short boat ride out to the Gulf of Mexico, while the many rivers and lakes provide excellent freshwater fishing. The Interstate 75 corrider connects Charlotte County with Tampa/St. Petersburg to the north, Fort Myers to the south, and Miami to the east. U.S. Highways 41 and 17 provide additional major throughways. The county has 48 parks/recreation areas, plus four state facilities, one federal wildlife refuge and six City of Punta Gorda parks. There are 12.5 miles of Gulf Coast beaches along the length of its barrier islands and spits, with 15 public beach access sites. Don Pedro Island State Park is only only accessible by boat. There are 28 marinas and 13 boat ramps located along the Peace River, Cape Haze Peninsula, Lemon Bay and Placida Harbor areas. The many canals within residential areas provide access to open water for a significant percentage of the population, reducing the demand for commercial facilities. Charlotte County is 5 – 25 feet above sea level. There are prevailing easterly winds with an average velocity of 12-18 mph. The climate is humid and subtropical — coconut palms grow only from Punta Gorda southward! The yearly average rainfall is 49.5 inches, with two-thirds occurring from June to September. The air in Charlotte County is the cleanest in all of Florida. Total suspended particulate value is a low 43, while the Florida standard is 150-TSPs. The U.S. Census Bureau reported that Charlotte County was the fastest growing county in the United States during 1980-1990, and it gained Metropolitan Statistical Area (MSA) status when the population surpassed 100,000. For more information about the economic climate in Charlotte County, including major employers and employment trends, labor force information, taxation, commerce and industry, visit the Charlotte County Economic Development Office. Population and demographic information about Charlotte County is available from the Charlotte County Economic Development Office.